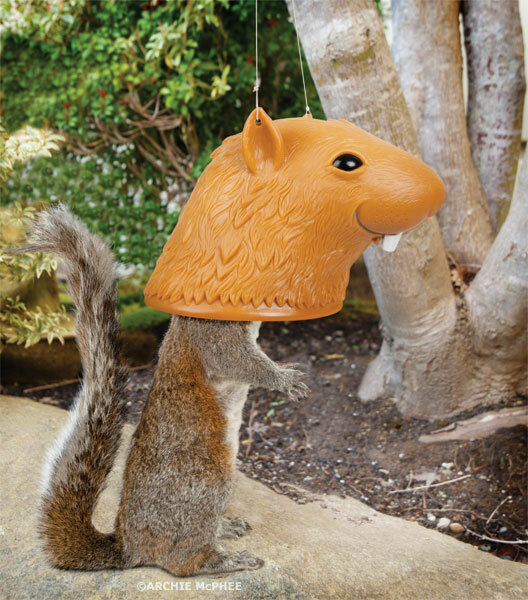 Big Head Squirrel Feeder Makes The Fluffy Rats Look Silly | OhGizmo! By David Ponce on 07/30/12 • Leave a comment! We don’t really like squirrels; shave their tails and they’re just rats. So we take great pleasure in the above feeder because it makes squirrels look stupid. Oh sure, squirrels can’t tell their dignity is being trampled, but you can laugh at their expense, and that’s all that matters. You could of course argue that if we really disliked squirrels we wouldn’t be feeding them in the first place. We don’t think of it that way. The squirrel food is the price we’d be ready to pay for the tiny bit lulz we can imagine ourselves having.